Your options for buying a vehicle in Canada seem to grow by the day, but in general, there are two entirely different choices for how you can go about it. Either through a dealership or through a private seller. Most dealerships offer new and used options (DriveNation specializes in used vehicles), that are bound by rules and regulations around the quality of product that can and cannot be sold. A private seller, on the other hand, is selling their personal, pre-owned vehicle outside of any stipulations or guarantees as soon as you pass off that cash or cheque to them. Each of these options provides positives and negatives, what it comes down to is your personal preferences and the goals for your car purchase. 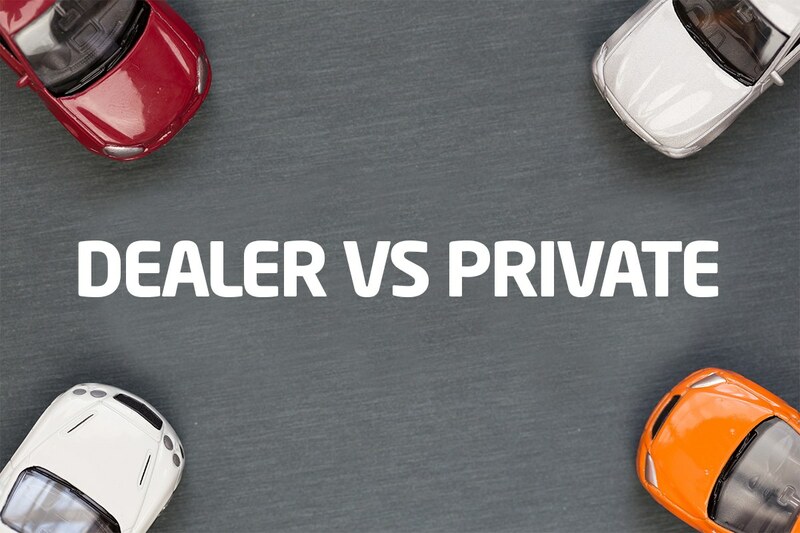 With that in mind, here are the four main differences when buying a vehicle from a dealership, instead of a private seller. Dealership – With vehicles being built with a lot more quality these days, the sheer number of cars on the road are increasing. This means in addition to new models coming out every year, there are more and more used vehicles to choose from. Whether you want something decked out with all the latest tech and accessories or you’re just looking for the best bang for your buck at low mileage, dealerships are able to have way more options on the lot and often can source any other vehicle you can even think up. Private Seller – Shopping specifically for a used vehicle. Can be difficult to find the exact made or model you’re looking for sold locally so you can actually go see it in person. Plus, if you find something you like, any upgrades or maintenance is solely on you. Dealership – With so many vehicle options available, finding a vehicle that fits your budget is a pretty simple process at a dealership. At the same time, dealerships often provide additional incentives on a month basis, ranging from cash back, to vacations and even referral bonuses. This can help reduce your purchase price in a variety of ways. Private Seller – When you put something up on any form of peer-to-peer marketplace site, what’s your number one goal? To make as much money as you can on the sale. Private sellers on Kijiji or Facebook Marketplace are looking to do the same. These sellers don’t have any overhead on their sale so their prices are often lower, but you need to be careful that you get what you pay for. To ensure you’re getting a good deal, check the posted price with the suggested retail on Canadian Black Book, which keeps average pricing on all years, makes and models of vehicles. At the least, this will give you an idea of what you should offer for a vehicle, despite its posted price. Dealership – Dealerships offer a wide range of payment options. If you want to pay cash, for sure. Need in-house financing? They have that too. Maybe looking to lease? That’s always an option. Not only are your payment plans customizable with a dealership but their access to numerous banks will usually get you the best interest rate possible if you choose to go that route. Their skillsets also give them a leg-up on pushing through all that paperwork, saving you time and money on dealing with a bank yourself. Private Seller – When buying from a Private Seller, you don’t have a whole lot of options of how you would like to pay. Generally, this is done by cash or cheque, where you would be required to have that money on-hand or in your account at the time of purchase. Buying a vehicle is the third biggest purchase of your life, so unless you have a large amount of money sitting around this can be difficult to accomplish. Subsequently, you could take money out as a personal loan, but interest rates are often rather high attached to these and they can be difficult to secure through a bank. Dealership – This is usually the biggest difference between a dealership offering and a private seller. Whether it’s new or certified pre-owned, you can rest assured knowing that these vehicles are ready for the road with no significant investments required. Many come with existing manufacturers warranty and DriveNation’s case, all used vehicles receive a multi-point inspection, 90 days/3,000 KM extended warranty, a free vehicle history report and are even available for seven day exchange. So not only are you aware of any issues the vehicle has had in its past, but you’re protected from surprise issues that may arise in its near future as well. Bye bye, buyers remorse. Private Seller – It’s an as-is market when you buy from a private seller. Often it is very tough to know what exactly you’re signing up for. You could pay for or get someone experienced to take the vehicle for a quick inspection, but it’s a very limited insight. Especially since you do not have access to a detailed accident history report from CARFAX. If the car does fail, as soon as that money and transfer of ownership has taken hands, you’re fully on the hook for repairs. There’s also the issue of verifying it’s not actually stolen or have additional liens on it that could cause further issues for you down the road. Due your diligence and you can come out on top, but there’s a bit more luck to this draw. At the end of the day the choice is yours. Buying a vehicle from a private seller can be like throwing something at the wall and hoping it sticks. If you’re a risk-taker, it’s a great idea, as you could grab a steal of a deal. However, you’re normally in for a lot more costs beyond the purchase price. We might be a little biased, but why take that chance when you get a great deal and the extra peace of mind, for free.